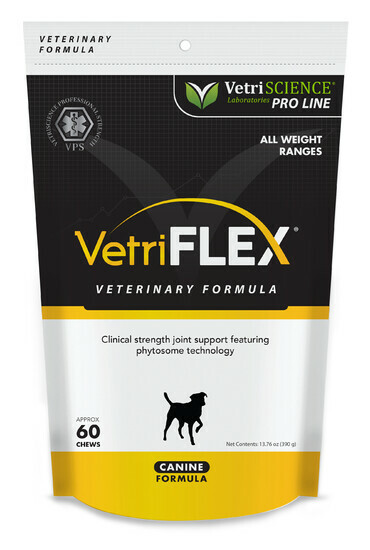 With patented, extensively-researched ingredients, including GlycOmega™ Perna, VetriFLEX is a trusted solution for structural support of joints and soft tissues. Its enhanced formula also supports liver, muscle, brain, eye and GI tract functions. This unique product combines the advanced formula in Glyco Flex® with ingredients that have been extracted using Phytosome® technology. The Phytosome® complex easily crosses the gut barrier resulting in superior bioavailability and significantly higher blood levels. 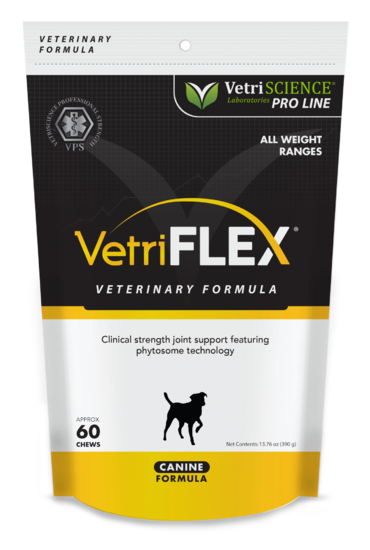 Our most advanced joint support formula for dogs and cats Patented Phytosome technology activates the antioxdant power of curcumin, boswellia and grape seed extract by providing greater bioavailability than standard extracts. acid, soy lecithin, vegetable oil, water.